Preheat oven to 350 degrees. Cream butter and sugar together. Mix in remaining ingredients except 1/4 cup sugar. Form one-inch balls and roll the balls in remaining sugar to coat. Press with bottom of a drinking glass to flatten . Place on ungreased baking sheet; bake 10 minutes. 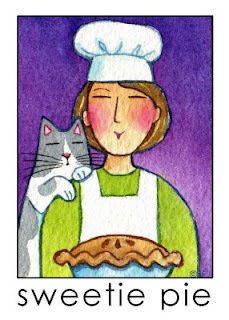 Cat Lady and Baker Amanda is known far and wide across the county for her pastries. 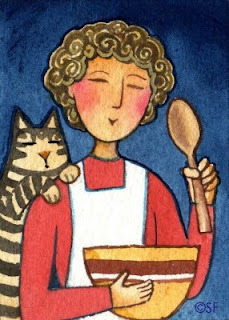 Each morning she wakes up at 4 a.m. and heads for her bakery, The Sweetie Pie, where she is greeted by alley cat Delilah. Peel, core and slice apples thin. In a bowl, stir sugar, flour, cinnamon, nutmeg and salt together and toss together with apples stirring to coat. Place in pie crust and top with another crust. Cut vents in top crust and bake at 400 degrees for 40 minutes. 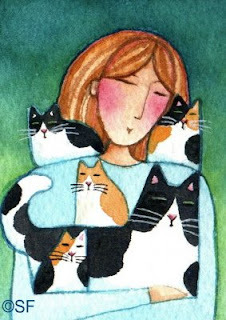 Calling All Cat Ladies! 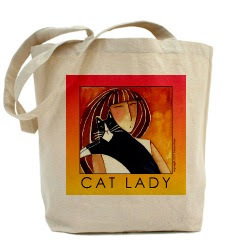 Don't forget to enter to win a free Cat Lady tote bag!! Contest ends February 28. Details are in this post: CONTEST TIME! When Cat Lady Sandy discovered a small and hungry cat on her doorstep, she fell in love and offered the little foundling a warm place to sleep, food, medical care and spaying, and the name Cricket. The trick is to wait until no one is looking, grab a strip, then run as fast as you can without tripping on it! Flashlights are not just for looking in dark places. They create magical skittering creatures called "beams" that are so much fun to chase when they go around and around in circles. 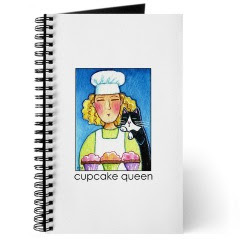 Need to keep track of your cupcake recipes? This blank book or journal is the perfect solution! Jovanna and Mr. 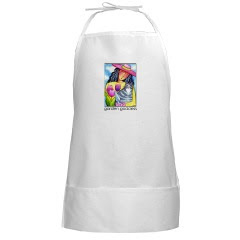 Midnight can also be found on kitchen aprons, t-shirts and other great gifts at: www.cafepress.com/SusanFaye. Cat Lady Tasha is enjoying a group hug with new Cat Mom Gypsy and her three precious kittens, all rescued from a local shelter! Tasha knows how important it is to have Gypsy and her kittens spayed and neutered as soon as it is possible, thanks to information she learned from the Humane Society's Spay Day USA website. Four million cats and dogs—about one every eight seconds—are put down in U.S. shelters each year. Spay/neuter is the only permanent, 100-percent effective method of birth control for dogs and cats and a proven way to reduce the vast numbers of animals who are born only to die prematurely and without a family who loves them. Learn more about why you should spay or neuter your pet. 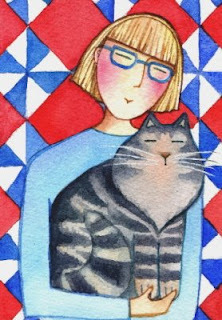 Cat Lady Anna Lee keeps her feline friend Rex in stitches...literally. His current wardrobe includes 12 knitted sweaters in every color of the rainbow, three hats with pom-pom tassels, one set of booties and a striped scarf. Enter to win a free tote bag!! 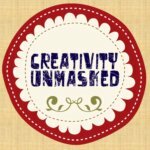 Details are in this post: CONTEST TIME! Cat Lady No. 53...Contest Time! Today they are most excited to learn about a contest that you too can enter! 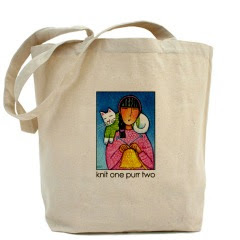 The prize is a Susan Faye Cat Waltzing Tote Bag, valued at $15.99, from my CafePress Shop . 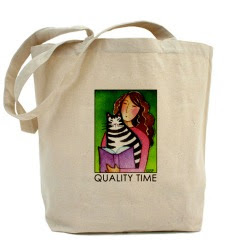 This extra-roomy 100% cotton canvas tote bag has plenty of room to carry your dancing slippers, how-to-waltz videos, and so much more. It features extra long handles for easy over-the-shoulder carrying. Here's how to enter: In the comments link below this post please complete the following statement: My cat's favorite dance is_______and here is why:________. You may also enter this contest at my Squidoo page www.squidoo.com/catwaltzing. The contest ends on Saturday, February 28 at midnight PST and the winner will be announced on Sunday, March 1st. My panel of esteemed judges will select the winner based on best choreography, originality, and sparkliest costume--no, wait--we'll just pick the one that makes us smile the most. Cat Lady No. 52...Ahoy Matey! 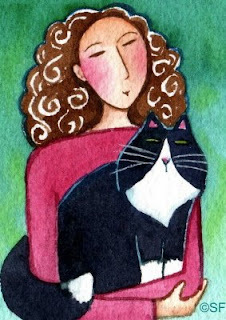 Cat Lady Lorelei thinks that her Tuxedo Cat Handsome Horatio was a sea captain in his past life due to his obsession with tuna and Jacques Cousteau documentaries. Today they will scout the waves for whales, then after sunset retire to the den and watch Master and Commander for the 22nd time, while Lorelei sips a rum toddy and Horatio dreams of white sails and salty breezes. 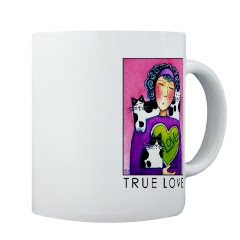 Looking for the purrfect Hot Toddy Mug? 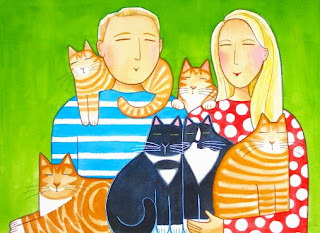 Loving Cat Lady and freelance illustrator Mildred was recently delighted to discover Illustration Friday, a website that presents a theme each week, then encourages illustrators to submit an illustration about that theme. 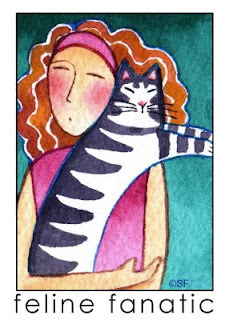 This week's theme is "Instinct", so Mildred plans to make an illustration of new Cat Mom Dottie and her four precious kittens, all just rescued from a local shelter! It's a very basic instinct for cats to want to have kittens so Mildred knows how important it is to have Dottie and her kittens spayed and neutered as soon as it is possible. She learned that Spay Day USA is on Tuesday, February 24, and found a low-cost spay clinic through very helpful links on their website. In the mean time, Mildred's instinct is to love and cuddle and enjoy all of her new bundles of joy! 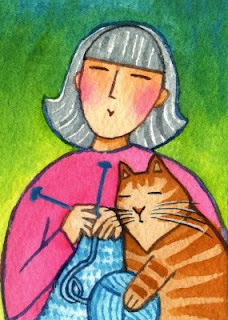 Cat Lady and long-time knitting enthusiast Pearl is starting her 5oth sweater to date, with the help of Stitches, her ginger tabby yarn wrangler. This sweater will be for her sixth grandchild, due in May. The other five grandchildren each have 6 hand-knit sweaters, not to mention hats, socks, scarves, and the occasional slipper booties. Yesterday Pearl and Stitches enjoyed a visit from Granddaughter No. 3 and Pearl was delighted to give her a knitting lesson. 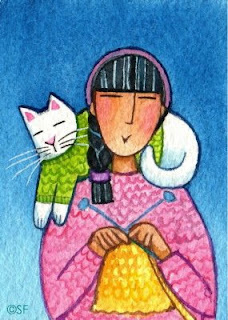 They chose pastels: pink and lavender and sky blue from leftover skeins of yarn, and began knitting a scarf. Stitches was very helpful and chose a ball of ginger peach (her favorite color...) to use for the fringe. 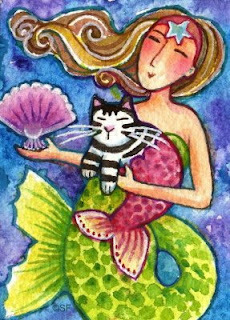 Mermaid and undersea Cat Lady Lyra and her Cat Fish Georgio have the largest seashell collection in the grotto. Lyra's personal favorite is the scallop shell, while Georgio is most excited when he finds a Murex Ramosus. 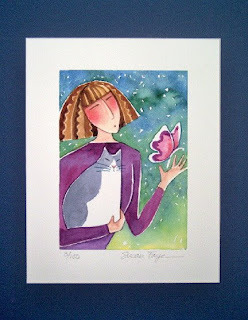 It is in ACEO format and these very affordable mini watercolor paintings are adorable when framed and arranged in a grouping! 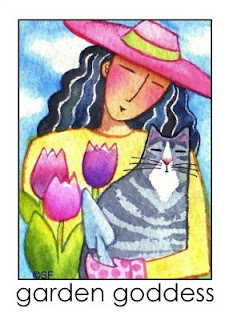 Cat Lady and Garden Goddess Sumi never gardens without her favorite pink hat and her faithful feline friend Suguru, who simply adores tulips. If you are planting other bedding plants amongst tulips; it is a good idea to plant them before the bulbs, so as not to damage the bulbs with the trowel later. Over crowded bulbs can also cause problems in your garden. If this occurs, dig up your tulips just before all the foliage has completely died down and divide by pulling smaller new bulbs from the base of the old bulb and replant them. After flowering, it is ok to deadhead your tulips but always allow the leaves to die off naturally. If you are concerned about the appearance of the fading greens, try braiding the leaves. Tulips make excellent cut flowers and usually last about a week in a vase. Don't forget to add a little sugar to your water to prolong the life of your bouquet. Cat Lady No. 47...Hail To Perspicacity! 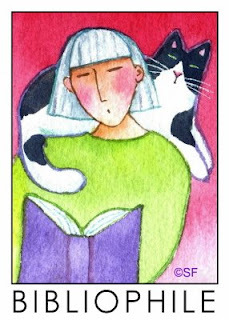 Cat Lady Mabel and feline friend Abraham are bibliophiles; in other words, they are hooked on books. Today they are reading President Obama's autobiography Dreams From My Father in honor of Presidents Day, and find it quite inspiring. Mabel is particularly delighted to have a President who has such a beautiful command of the English language and speaks so articulately and with such elegance. 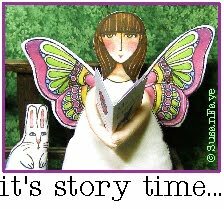 Mabel loves words: obscure words, funny words, multi-syllabic words. Her favorite word today is perspicacious. She believes that our new president is perspicacous and hopes you will look it up in the dictionary, because it is a fun word to use once in awhile. Abraham loves words too. A few favorites that he enjoys hearing are tuna, sun beams, and out bad dog. Abraham likes to think that he is perspicacious too. Book Bags Galore!...My 100% cotton canvas tote bags have plenty of room to carry everything you need, including dictionaries for words like perspicacity. They include a bottom gusset and extra long handles for easy carrying. 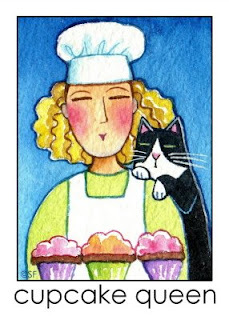 Cat Lady Adora is enjoying an afternoon in the kitchen with Cat Mom Snickers and her kitten SnickerDoodle! As you might guess by her furry friends' names, Adora has a weakness for sweets. 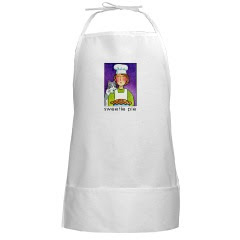 The very first thing Adora ever learned to bake was a Snickerdoodle in Mrs. Nix's Seventh Grade Home Economics Class. The class had spent the first two weeks of class at the sewing machines, learning to fill a bobbin and making aprons out of gingham. They then advanced to the row of shiny ovens and learned the finer points of sifting, measuring, and mixing. Mix all ingredients together. Spread in a lightly prepared 11 x 7 x 1 1/2-in. pan. Bake at 350 degrees F for 30 min. Cut into squares while still slightly warm. Finnegan: "our sweetie scaredy cat....I am the only one who ever gets to pet him and snuggle with him late at night." Gus: "He is our tuxedo boy....most distinctive feature (other than the fact that his back legs don't work very well) is those long white whiskers against that black furry face. He is our 'special needs' child....he has a gazillion and one things wrong with his body/health and yet he is the craziest, purrbox on earth." Rosie: "Our robust tuxedo girl....she is known as the 'Oozie Buddha'...I love her more than I can express...my bestest girlfriend. She is quirky and silly and makes me laugh constantly." 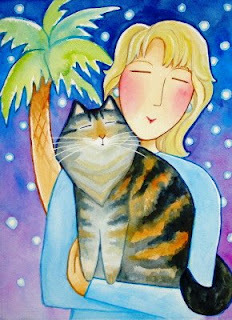 Teeny: "Our orange tabby pumpkin beach ball...she is our first 'child'. She is quite grouchy and wishes she had remained an only child. She loves her mom and no one else. " Rooney: "The most handsome boy ever! He is a deep orange mackerel tabby with white accents including an adorable white milk mustache. Rooney loves other cats and all people. He is the all around, affectionate, purrfect boy. He is Brian's favorite for sure." Heidi: "Our newest addition...she is a buff tabby...very slim and petite with a super long tail. When we rescued her, she was yelling at us as we drove by and is still hollering at us...constantly meowing. She LOVES to snuggle up really close to us...either on our shoulders or tucked in an armpit." 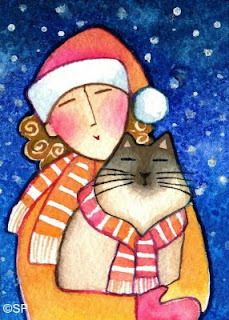 "He has a treat - a spoonful of Fancy Feast - each morning and evening and he sometimes leaves a bit in the dish. I scoop those remains into a little mound to make it easier for him if he wants it later. Sometimes he comes back and finishes it -- but other times he leaves a definite message: Somehow he fills the food dish half-way with water from his bowl! "I do not know how he does it. There is never any spill onto the mat or the tray beneath the treat dish or the water bowl. But the message is just so clear. . . 'I SAID I was finished.' "
When not performing mysterious games with his food, Quincy also amuses himself by playing hide and seek behind the shower curtain and by watching the chickadees outside the window. "How can people not have a cat?" Donna wonders. "What a joy Quincy has been to me for almost nine years." And don't forget to help Quincy count chickadees today as part of the Great Backyard Bird Count! 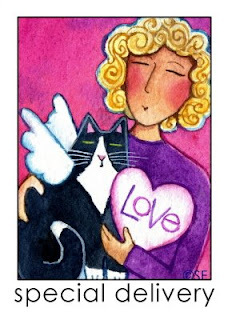 Cat Lady Jovanna is delighted to receive a very special Valentine, just delivered by Cupid Cat Caprice. The Valentine came all the way from Italy, from Jovanna's grandmother in the Tuscan countryside. Caprice's feathers aren't the least bit ruffled after such a long flight all the way to Brooklyn, but nevertheless she is delighted to be offered a bowl of cream as a thank you. What do you call a very small Love Letter on February 14? What does Farmer John give his wife on February 14? What did the boy octopus say to the girl octopus on Valentines Day? I want to hold your hand, hand, hand, hand, hand, hand, hand, hand! 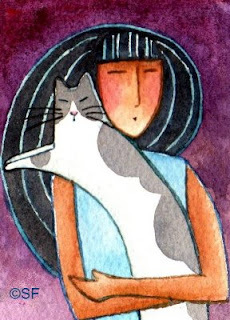 Jovanna and Caprice can be found on a variety of Valentine cards, note cards, postcards, t-shirts and other gifts at: www.cafepress.com/SusanFaye. 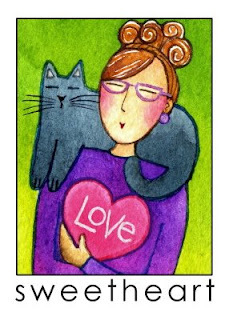 Cat Lady Jimena just received a Valentine from a secret admirer. 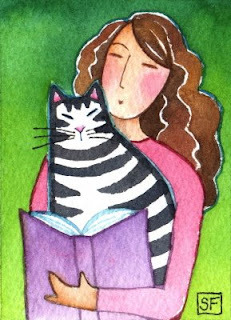 Feline Friend Fernanda knows it's from the cute bicycle repair man down the street, but she's going to keep it a secret for now, and let Jimena guess who it's from. So she will bask in Jimena's adoration just a few days more if possible and purr just a bit longer and louder to make sure that Jimena knows who the real sweetheart is. 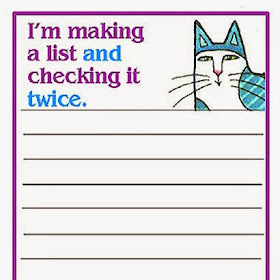 Need to keep track of your secret admirers? 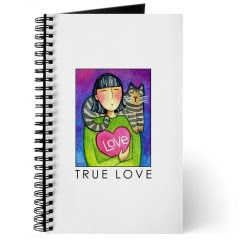 This blank book or journal is the perfect solution! Jimena and Fernanda can be found on a variety of Valentine cards, note cards, postcards, t-shirts and other gifts at: www.cafepress.com/SusanFaye. Cat Lady No. 41...More Snow! 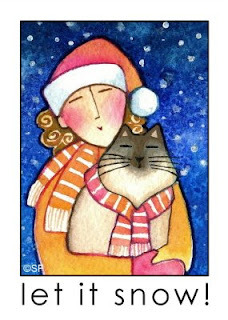 Cat Lady Norah and her Himalayan beauty Priscilla PrettyPaws always wear matching striped scarves when sledding. Imagine their delight when they awoke this morning to find a fresh blanket of snow. 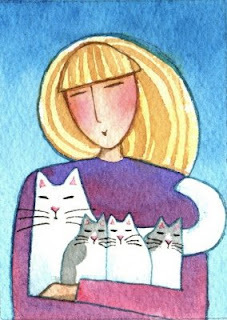 These very affordable mini watercolor paintings are adorable when framed and arranged in a grouping! 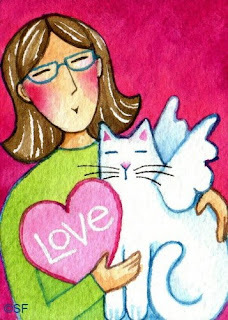 Professor of English Literature and Cat Lady Joella has just received a special Valentine delivered by Boswick, a Cat Cupid. She is speechless. Within the leaves a slumbering bee. The bee awak'd, and stung the child. Boswick is delighted by the impromptu poetry recitation and purrs contentedly as he glides off toward his next delivery. 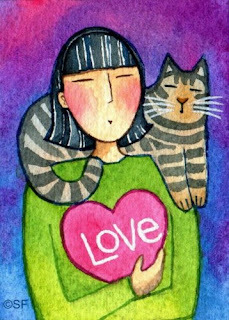 Joella and Boswick can be found on a variety of Valentine cards, note cards, postcards, t-shirts and other gifts at: www.cafepress.com/SusanFaye. Jojo was a special needs kitten with brain damage when Sarah and husband Bill rescued her: "She could only scoot around in little circles and might only be a lap cat for the rest of her life. We came in to see her and just fell in love on sight! Even with the problems she had, we had to take her." "We did physical therapy with her to help with her motion control and put a ramp up to the bed so she could get up there easier. She was very sick during the first couple weeks, and one night I spent the night on the bathroom floor with her with the humidifier. She has a special little Jojo walk, and when she jumps she overshoots her target, but there is nothing she can't do anymore!" Jojo just turned eight, and her vet is happy to report Jo no longer displays any neurological symptoms; apparently her brain has remapped itself! Says Sarah: "I like to think it's all the love that made the difference. She is our little miracle." Jojo often has a starring role in Sarah's websites: SARAH HUNT PHOTOGRAPHY and OC PET PHOTOS. Check them out! Cat Lady Dahlia and her furry friend Murray enjoy communing with nature. 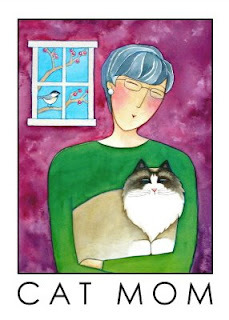 This week they are priming the bird feeders with seed and suet ("bird bait" as Murray likes to call it, in his cat-humor sort of way), in preparation for the Great Backyard Bird Count which takes place Valentines Day Weekend, starting Friday, February 13. Unfortunately for Murray, but luckily for the birds, all of the feeders are much too high and Murray is much too plump to reach any of the feeders. So he will be content to sit inside with Dahlia and her binoculars and count their feathered friends for a few hours each day. Thanks for visiting! I'd love to hear your feedback in the comments section below. Cat Mom Mercedes has lost her heart to these three little rascals, dropped off at the cat rescue shelter where she volunteers on Fridays. Sadly, millions of little sweethearts just like these are destroyed each year because there are simply too many cats and too few loving homes. A simple solution is to spay and neuter pets and feral cats. In the mean time, Mercedes will try to find loving homes for the triplets, and in return they will continue to be adorable and put a smile on her face. Now that's true love. 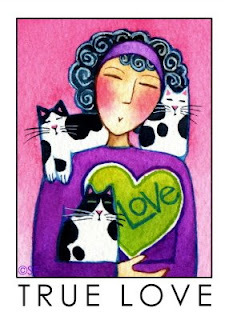 Mercedes and her kittens can be found on a variety of Valentine cards, note cards, postcards, t-shirts and other gifts at: www.cafepress.com/SusanFaye. 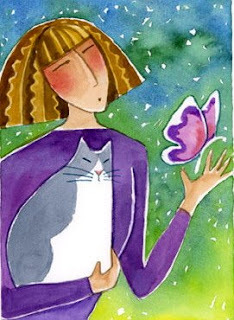 Cat Lady Celina and her feline, Felina, long ago decided it might be fun to join a few clubs. They formed the Celina Felina Mutual Admiration Society, membership: two. They were so pleased with their new club that they never bothered to join any other groups. That is, until now. 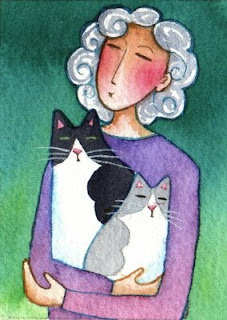 Recently, Celina's next door neighbor Rhonda invited them to join the Society for the Preservation and Advancement of Waltzing with Cats, also commonly referred to as the Cat Waltzing Society. Want to know more about this latest dance rage sweeping the ballrooms across the country? Visit THE WALTZING CAT and you'll find waltz music, dance instruction, Official Cat Waltzing Apparel, plus much, much more to enhance your Cat Waltzing experience. Georgia is happy to note that the sun is setting just a tad later each evening. "You know what that means," she smiles as she scratches Vincent behind the ear. "Spring is on the way! Tulips, garden parties, longer sunsets! " Vincent knows what it REALLY means. It means that it will soon be time to shed a remarkable percentage of his magnificent fur coat. 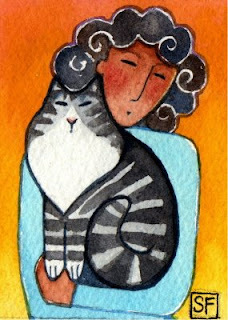 It means being groomed with that nice soft brush that tickles just a little bit and makes him purr. It also means more appearances of that wretched vacuum monster that screeches over the carpet and tries to gobble up cats. Cat Lady Stella thinks her cat Ashton Grayboy is an absolute sweetheart. The feeling is mutual. Today Ashton is helping Stella prepare for making pop-up Valentines in her third grade classroom. Stella won't let him play with the scissors, but he loves to help by knocking the pencils onto the floor and chasing the paper scraps about the room. 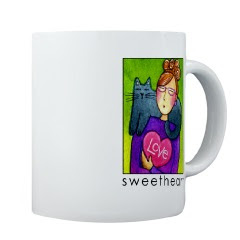 Stella and Ashton Grayboy can be found on a delightful selection of Valentine items including this colorful mug. 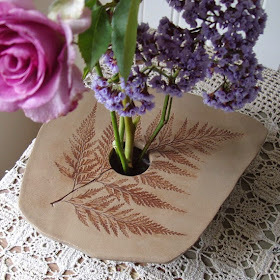 Fill it with candy, pencils, or other small treats and surprise your sweetheart. 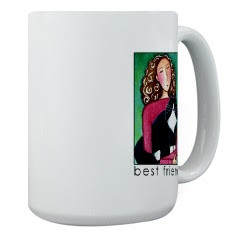 You'll find more fine gifts at: www.cafepress.com/SusanFaye. 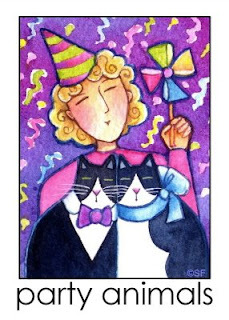 Like any good Party Animals, Cat Lady Janelle and her sidekicks Dapper Dan and Dame Dora will kick up their heels and bask in confetti at the drop of a party hat. Groundhog Day is just such an occasion. Dan and Dora have spruced up their tuxes, and Janelle has the confetti and noisemakers at the ready. Soon they will be decorating the Woodchuck Tree and singing Whistle Pig carols and sipping 'hognog. The best part, though, is the exchanging of the Groundhog Day gifts. Dapper Dan and Dame Dora always ask the Great Groundhog for rodents under the tree, but usually get catnip toys instead. This year Janelle will be especially surprised with her gift... a little something that Dan and Dora caught just this morning...right before they saw their shadows! 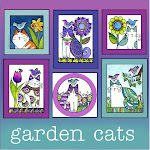 A delightful selection of Party Animal giftware, including invitations, party favors, and t-shirts can be found at: www.cafepress.com/SusanFaye. Plants: The temptation of climb them, shred them, redistribute their soil. Impromptu Cat Toys: What's the harm in imagining that Mona's paint brushes are dangerous furry stick critters that must be subdued before they go berserk? Unauthorized Napping Humans: As Mona recounts: "Budda’s most recent failure to maintain peaceful centeredness involved an incident while Mike was napping on the couch. Budda hunkered down as if stalking, then catapulted himself onto Mike’s chest. After a dramatic pause, he threw in a 2-pawed slap in the face, for good measure." Water: Fascinations include food dish water, toilet bowl water, paint rinsing water, and the redistribution of said water throughout the art studio. This leads Mona to ponder: "How does a cat manage to get water all over the toilet seat, the floor, and half way up the wall, and yet he, himself remains completely dry?" Don't resist this temptation...My 100% cotton canvas tote bags have plenty of room to carry everything you need, including books on Marcus Aurelius. They include a bottom gusset and extra long handles for easy carrying.